The Intel Edison is small, Wi-Fi and Bluetooth enabled development board running an Atom processor. It can be mounted on an Arduino-compatible board in order to interface with the wide variety of shields available. I was interested in running Node.js and Johnny-Five – an open source framework originally created for robotics – on the Edison and connecting it to Azure IoT Hubs (Microsoft’s PaaS offering for the IoT). The Azure IoT SDK requires Node.js 0.12 or greater. The Yocto project image (the officially supported Linux image for the Edison) only supports Node.js 0.10. Updating Node.js on Yocto is a non-trivial task. Thanks to some ideas and help from Rex St. John and Rick Waldron, I was able to accomplish this. ubilinux is a Debian variant and allows installation onto the internal flash of an Intel Edison platform. Where the Yocto project is a custom configured Linux image that Intel has built to be lightweight, ubiLinux is a more full-featured Debian variant that, among other things, allows the installation of different versions of Node.js. The installation instructions for ubiLinux are pretty straight forward. Using either PuTTy (Windows) or Terminal (Mac OS X), connect to the Edison setting the baud rate to 115200. Press Enter twice and log in with the user name root and the password edison. Once connected, set the time of on the OS to the current UTC time (you need to check and possibly set the time whenever the Edison is without power for any duration). If the date is incorrect, execute the following, replacing the date and time with the current UTC time. Remember: You need to check (and possibly correct) the date any time the Edison has been without power. Use vi to edit the interfaces file (where the Wi-Fi connection information is maintained). Edit the following, changing Emutex and passphrase to your SSID and passcode respectively. After networking is restarted, ensure the Wi-Fi is running. bound to 192.168.1.54 -- renewal in 39220 seconds. From the terminal session, clone the Node Version Manager (NVM) repo. Use NVM to install whichever version of Node.js you prefer. For this example I am installing Node.js v4.3.1 (stable and mature), but you could install 0.12.7 or 5.0.0 or 5.6.0, or stable, etc.. This will install Node.js v4.3.1 and make it the current version (e.g. running node -v will tell you the current version). Congratulations! 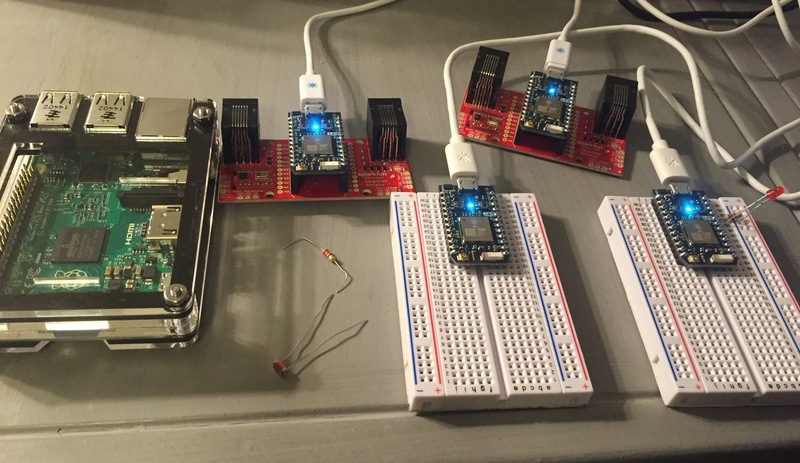 The Edison is now set up with Node.js 4.3.1 and ready to run an app that leverages sensors and communicates with Azure IoT Hubs. For this example I am using the Grove Stater Kit – Intel IoT Edition from Seeed Studios, although you could use something else if you’d like. The advantage of prototyping/experimenting with the Grove kits is that they eliminate the error-prone wiring and breadboarding and make connecting a variety of sensors to digital, analog and I2C pins easy. The Grove kit includes an Arduino compatible shield that a wide variety of sensors plug into. 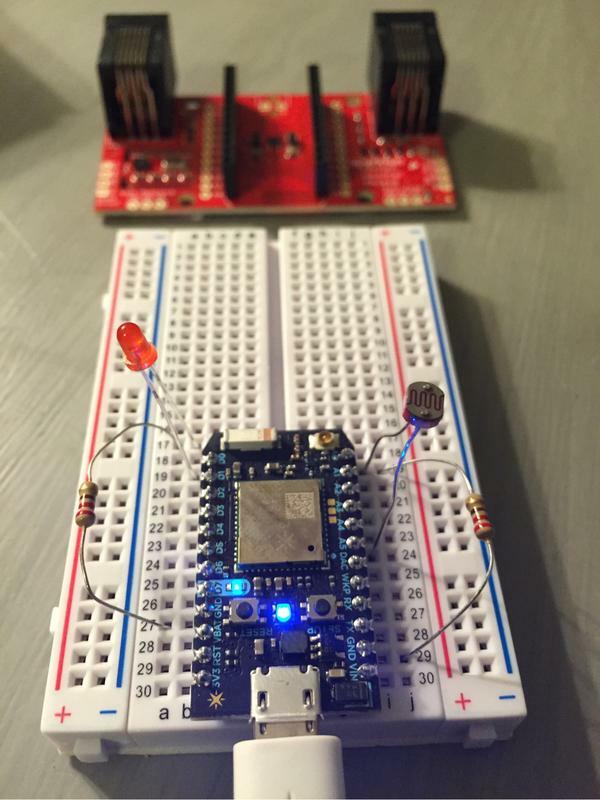 The app I built uses the Grove kit, but you can easily modify it to use sensors on a breadboard – so continue reading even if you don’t have the Grove kit. Johnny-Five is a framework I have been using a lot because of its nice abstraction of the GPIO complexities and exposes objects for the development board and sensors. The board and input sensors have events that invoke callback functions making it easy to work in an event-driven way. Start by defining the application manifest, including the dependencies. In your working directory on you PC, create a file called package.json. // For this lab we will use AMQP over Web Sockets. // and uncomment one of the other transports. 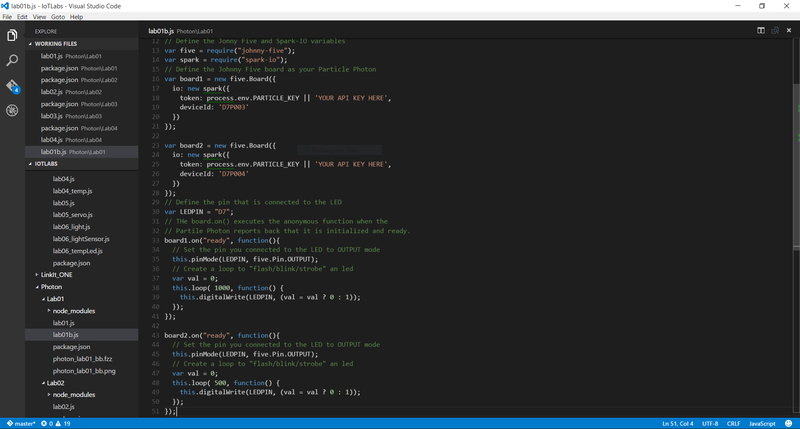 // The client is created in the context of an Azure IoT device. // Define the sensors you will use. // reject and abandon follow the same pattern. // board reports back that it is initialized and ready. // Grove Shield's I2C jacks. * The LCD's background will change color according to the temperature. // If there is no change in temp, do nothing. Using FileZilla you can connect to the Edison using sftp and drag-n-drop files onto the Edison. Set the Local site path to the directory where your app files are located. Under the root directory on the Edison (Remote site), create a new directory named iot-labs. Drag the application files from the Local site directory to the Remote site directory. From the terminal session, move to the iot-labs directory. Use NPM to install the application dependencies. The application will launch and you will see some initial messages as the board initializes. After a few seconds you should see the temperature displayed on the LCD screen, and every five seconds you should see a messaged sent (‘enqueued’) to your Azure IoT hub. You can monitor the messages coming into Azure IoT Hubs by using the iothub-explorer command line utility. In a new terminal window, install the iothub-explorer with NPM. Once installed, turn on the iothub-explorer event monitor (this will monitor messages as they come into your Azure IoT hub – so you know they are getting there). Note: On Mac OS X put the connection string in quotes. On Windows, do not use quotes). You should see the same messages that your Edison is sending showing up in the monitor. This block listens for incoming messages over AMQP and evaluates them for the sting led in the body of the message. If led is found, and the very next item in the body (split on a semicolon) is the word on or off, then the LED state is changed respectively (this is a simple/crude example of how to do this). Try it a few times using led:on and led:off as the message body. There you have it. You can now use Node.js on the Intel Edison to send Device-to-Cloud messages and receive Cloud-to-Device messages (which can be command messages). For these workshops I’ve decided to do something different – mostly driven by the fact that I gave away all 300 Arduino Yun kits I had (based on the SparkFun Inventors Kit) and one of my colleagues donated 180 Particle Photon development kits (and SparkFun Weather Shields) to me. Particle already has some great getting started documentation and Paul DeCarlo already has a great tutorial on using the Weather Shield with Web Hooks on Hackster.io. I wanted to do something different to show how to build interesting IoT solutions, and leverage Microsoft Azure services where it makes sense. I decided that my best angle is to build a series of labs that teach you how to use the Particle Photon with the Johnny Five framework (which we use in the existing Arduino labs on ThingLabs.io). The difference here is that, unlike the Arduino Yun which has a Linux distro onboard, the Photon has a small ARM M3 and a Broadcom Wi-Fi SOC – but no Linux distro. That means that unlike the Arduino labs I can’t build labs around creating Node.js apps that will eventually run in the onboard Linux environment (because there isn’t one). Instead I looked around my house….WeMo. That is a great example of how the Photon works. Individual devices connected directly to a cloud service. SmartThings. Phillips Hue. Hmm. These are different. They use a hub-and-spoke model, with the hub acting as a field gateway between the spoke devices and the cloud service. The Photon is a Wi-Fi enabled board – why can’t it enable the spoke devices on my local Wi-Fi network and connect to a hub…perhaps a Raspberry Pi 2 or an Arduino Yun, which acts as the field gateway. It turns out it can. I turned to the VoodooSpark firmware and the Particle-IO plugin for Johnny Five. VoodooSpark is open source firmware for the Particle Core and Photon that enables TCP communication with the device over a local Wi-Fi network instead of through the Particle Cloud. That means that with the VoodooSpark firmware you can build a local network with devices that you can communicate with. The way you accomplish that is with Johnny Five, an open source framework for hardware devices like Arduino, Raspberry Pi, Intel Edison and yes, the Particle Photon (enabled with the Particle-IO plugin). With these bits of open source deliciousness I can configure the Photon to communicate over local Wi-Fi to whatever hub device I want, running a Node.js app. Right now that is my Windows 10 laptop, but soon it will be a Raspberry Pi 2 or an Arduino Yun (I haven’t decided yet). The hub device can communicate with multiple spoke devices (Photons or others) and act as the go-between to the Azure services. In the example shown here I simply configure two Johnny Five board objects based on a Particle object (or a Spark object as shown here – I am updating this to the Particle-IO code – Spark-IO is the old code from before Particle was Particle) that defines my Particle Cloud access token and the device ID (so the hub can call the service to get the Photon’s IP address). // the frequency of Nitrogen messages. I am cranking away on the new labs – they will debut on ThingLabs.io around the same time as the TECHintersection conference in a couple weeks. This lab series will culminate (hopefully – I haven’t built this yet) in a smart home solution using a Raspberry Pi 2 as the hub and one or more Photons as spoke devices for things like ambient light and temperature, lighting control, open/close blinds, garage door monitoring, etc. If you want to spy on me you can watch the code evolve here.